The film’s costume design team of Rita Ryack and John A. Dunn tells us so much about the story and the characters, not only in the clothes themselves but how they are worn. 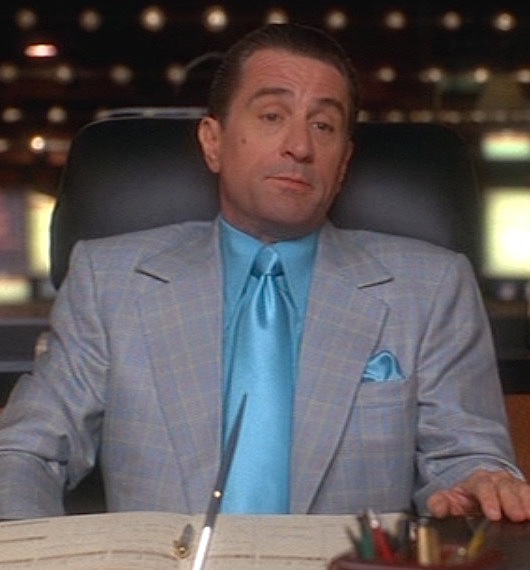 An analytical guy like De Niro’s Ace Rothstein might not be expected to dress as colorfully as he does but he’s still a mob gambler in a mob world, and that sort of atmosphere tends to create a flashier sartorial aesthetic. One need look no further than this brief scene to get a sense of who Ace Rothstein is through his clothing. We find him sitting at his desk, looking neat and a touch luxurious in his sky blue shirt and matching tie. When his secretary announces that he has a visitor from county commissioner Pat Webb (L.Q. Jones), he requests that she give him “a minute” and reveals to the audience that he’s been pantless, as he rises from his desk in undershorts, socks, and shoes. He crosses to the closet and coolly fetches a glen plaid business suit, pulling both jacket and trousers off the hanger to prepare for his guest. Ace is all about precision, always wearing his tie tightly knotted and fastened around his neck and doing his part to prevent any wrinkles or possible imperfection to one of his many suits. Despite all the red, pink, yellow, and mint-green jackets lining his closet, Ace Rothstein still needs a few suits he can count on for days conducting serious business. Glen plaid has been one of the most popular patterns for business suits since Edward VIII popularized it in the early 1920s, establishing a very specific plaid now known as “Prince of Wales check” to pay homage to his title at the time. When facing off against Pat Webb, Ace wears a finely checked glen plaid suit in blue, light gray, and gold with a coral windowpane overcheck. As bold tones of blue, yellow, and red are some of Ace’s most frequently worn shirts and ties, this suit was a wise investment as any shirts and ties in those colors would call out their corresponding tone in the plaid suiting. Despite his painful ulcer, Ace comforts Ginger after she suffers a breakdown. The single-breasted suit jacket has sharp “fish mouth” notch lapels that roll to a low stance of two recessed gray plastic sew-through buttons. There is a single, purely vestigal button with a short vent on each cuff. The wide shoulders have roped sleeveheads, and there are long double vents. The jacket has low rear-slanting hip pockets with large flaps and a welted breast pocket where Ace wears a puffed sky blue satin silk display kerchief. Supposedly, the Yes / NO sign was based on decor in the real Frank “Lefty” Rosenthal’s office at the Stardust. The sky blue silk shirt, tie, and pocket square were all made to match by Anto Beverly Hills, who had also provided shirts for the real Ace, Frank “Lefty” Rosenthal. The shirt was made from the duller charmeuse side of the silk with a large “1977” point collar, epaulettes that button at the shoulders (rather than at the neck), single-button tab cuffs, and a breast pocket with “V”-point stitching on the front. Ace’s tie is made from the same shiny satin reverse side of the silk as his sky blue pocket square. He wears it tied in a four-in-hand knot with a perfect dimple below the knot. There isn’t enough Mylanta in the world to deal with all of Ace’s problems. Once he actually puts them on, Ace’s suit trousers are revealed to have a medium rise and a flat front, with a fitted waistband that extends across the front with a squared hidden-hook closure tab. The trousers also have frogmouth-style front pockets and slightly flared plain-hemmed bottoms with a full break that nearly dwarfs his shoes. Casino does plenty to illustrate the mob as silk-suited interlopers in a land that the more “homespun” cowboy types consider to be their birthright. When Nevada born-and-bred county commissioner Pat Webb (L.Q. Jones) arrives for this terse meeting with Ace, the camera lingers just an extra moment on their feet. The men are shaking hands and looking each other in the eye, but Scorsese wants us to have this moment of appreciating both men for their slightly impractical footwear: Ace with his powder blue patent leather loafers and Webb with his snakeskin cowboy boots. The men’s differences are as obvious as their choices in footwear. With such a full break on his trousers, there’s no need for Ace to worry about matching his socks to continue the leg line, so he wears a pair of sheer silk beige socks that extend up to just below his knees. Ace’s habit of working pantless reveals not only the height of his socks but also his choice in underwear, here a pair of cotton boxer briefs in a cool shade of light blue. Ace Rothstein puts his pants on one leg at a time, just like the rest of us… though he’s the sort of guy that would try to find a way to put on both legs at once. Ace’s white gold jewelry and accessories perfectly echoes the aesthetic of his outfit, from the 14-carat ring on his right pinky with an emerald-cut aquamarine stone in a geometric polished shank to the 18-carat vintage Bueche Girod wristwatch with its blue square dial tri-sected by thin white gold bars. 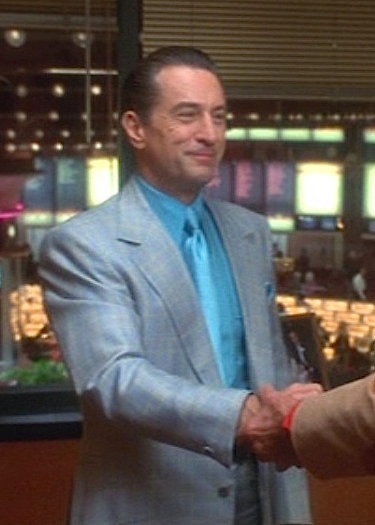 This suit seems to get double the treatment on Ibraheem Youssef’s poster depicting all of De Niro’s tailored menswear over the course of Casino, reflecting both the suit’s first appearance as Ace is seen gifting a Rolls-Royce to “Jonathan and David” (a thinly veiled reference to Siegfried and Roy) as the third suit from the right on the third row and again for this scene in the center of the fourth row. Ace Rothstein is hardly a conservative dresser, but that doesn’t mean he can’t find a way to incorporate his penchant for color into a more business-appropriate suit. I appreciate the fact that he’s your brother-in-law… and I do want to help you and I like to do favors. I know who you are, but I cannot do that. Always good to see a Casino post. A great film with a great wardrobe. Superb post. The Magnificent Scorsese sure gives you much to work with. I hope you’ll consider doing The King Of Comedy at some point. Your eye for detail is very much appreciated. Great idea – thank you for the suggestion and the kind words!